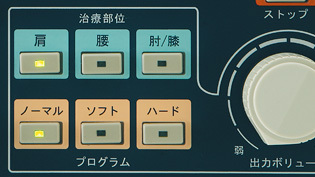 As shown on Panel, 9 different curing programs are installed. 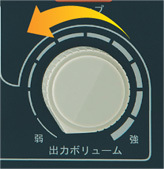 Heat output, installed in the Topra pack, can be adjusted at 6 levels. 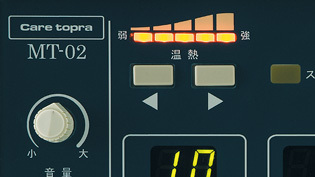 In completion of treatment, output volume returns to zero position automatically. Monitoring lamp tells when treatment is finished. By detecting the breaking of wire, and insufficent water level at wet-cloth, then give a warning message as “To check the Topra pack”. 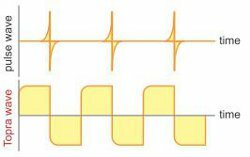 Compared to the genarally used pulse wave, the Topra wave produces a stronger and longer lasting electrical current. This greatly improves treatment results since the wave can overcome the resistance of the skin and muscle and penetrate deeply to reach the nerve or muscle of the affected area. 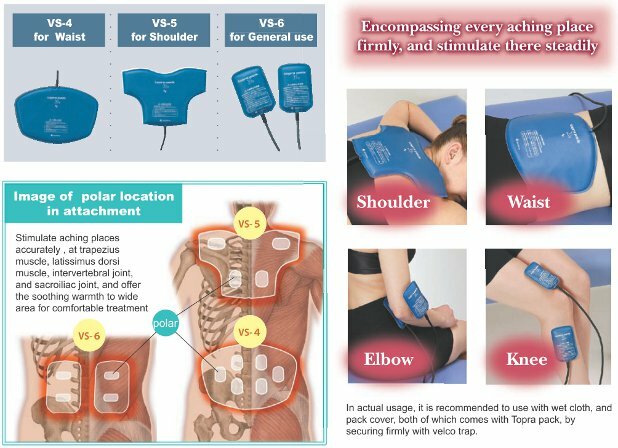 Topra pack VS Series have been implemented the increased flexbility by using leather cover and further thinness by using titan polar which allows to fit firmly to aching places. Furthermore, incorporated heater gives comfortable warmth during treatment. Copyright (c) CELCOM, inc. All rights reserved.